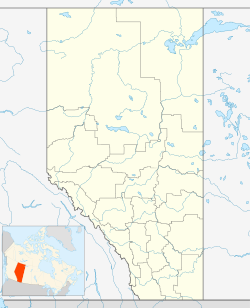 Munson is a village in central Alberta, Canada. It is located 13 km north of the town of Drumheller along Highway 9 and the Canadian National Railway tracks. Prior to the end of World War I, Munson was the site of a Ukrainian Canadian internment camp where the prisoners laboured on the railway. The camp, which remained open until March 21, 1919, consisted of shelters made of railway cars. In the 2016 Census of Population conducted by Statistics Canada, the Village of Munson recorded a population of 192 living in 82 of its 89 total private dwellings, a −5.9% change from its 2011 population of 204. With a land area of 2.53 km2 (0.98 sq mi), it had a population density of 75.88975.9/km2 (196.552196.6/sq mi) in 2016. In the 2011 Census, the Village of Munson had a population of 204 living in 81 of its 89 total dwellings, a -6% change from its 2006 population of 217. With a land area of 2.6 km2 (1.0 sq mi), it had a population density of 78.46278.5/km2 (203.214203.2/sq mi) in 2011. ^ "Location and History Profile: Village of Munson" (PDF). Alberta Municipal Affairs. October 21, 2016. p. 477. Retrieved October 23, 2016. This page was last edited on 1 December 2018, at 18:55 (UTC).